The master bedroom, with private balcony, is the perfect private retreat with his-and-her closets and stunning spa like ensuite. 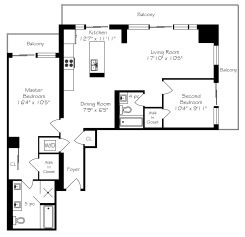 The second bedroom is perfectly functional in size with a spacious walk-in closet. Oversized windows (with roller shades) allow for plenty of natural light in this space. This bedroom has access to the main washroom. The building amenities are endless, 24-hour concierge, state of the art fitness area with Yoga and Pilates studio, one of a kind party room and indoor pool. Only a thirty-minute drive to downtown Toronto and easy access to the GO Train. Move in today!